Home Editorials Ladies: STAY OUT of the passing lane. Please. Look, women, I love you, I took feminism in college, I’m not going to tell you where “your place is,” but honeybuns I’ll tell you where your place isn’t and that is the left lane.Sugar plums, we’re obviously beyond the point of trying to explain to you that the passing lane is, as the name implies, for passing, that making progress with that is clearly not compatible with your cognitive… qualities, so let’s just simplify this a bit and ask you, respectfully, to stick to the middle or right lane at all times. Preferably the far right. If you’re in labor or having some sort of woman situation and need to drive faster, well, okay, put your hazards on and use the shoulder (that’s probably bad advice). 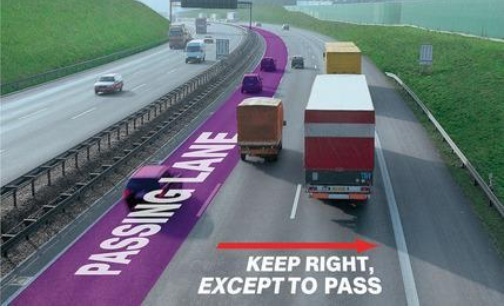 The passing lane is for men. Don’t blame me, you proved that point yourself, cutie pie. Now, you arrogant male speeders who think you’re driving plenty far enough above the speed limit that it’s okay to just linger around in the passing lane even with people behind you with the regular lanes wide open, that 88mph “ought to be fast enough for anybody” or, more likely, you don’t want to be emasculated by letting others pass you, EFF YOU BUDDY, you are worse than these women drivers in my book. Women are I guess born differently, mostly in beautiful ways (go on Google Images, these dames are terrific stuff), but you men have no excuse for that horseshit, get the hell out of the way Jack. If you want to call yourself a man, don’t you ever let someone pass you on the right, do not put people in that situation. If retention of your manhood isn’t important to you, revisit the opening sentence as it applies aptly to you. Now, back to you women, cupcake, when you come to a four-way stop sign intersection with another car simultaneously, please only yield to the car to your left only if he or she clearly stopped before you did. When in doubt, just go, buttercup. Do not panic like at the grocery checkout or whatever it is that goes through your pretty little heads when you wave at the other driver to go, mouthing “No, you, you go. Just go, go.” When you do that you slow everybody down, princess! It’s like rubbernecking, except there’s nothing interesting to see, just the jammed up traffic because a couple broads can’t remember left and right. It’s not that complicated a rule if you can just try to tame your hysteria. Maybe if we made the stop signs pink it would relax you? I’m sorry, I crossed the line with the pink sign remark, babydoll.What, am I being a big jerk with this? Am I exaggerating? Grab a beach chair and a clipboard, go to a four-way intersection and take note of the gender of drivers who encounter this simultaneous stopping situation and either yield incorrectly or without hesitation go when it’s their turn. You’ll notice a clear gender-related pattern the tone of my article implies. Yes, I actually did that. But I did it with girls who affirmed the veracity of my data, which they helped collect (though the nature of the experiment was my idea), for our Social Psych class. Got an F for that, but the teacher was a woman; so, draw your own conclusions. As I’ve been rear-ended 2ce in the last 3 months, you’re damn right I stay in the right (unless I need to turn left). I’m STILL twitchy about people being too close. Jerks. That lingering in the passing lane because you feel you’re going fast enough drives me up the proverbial wall. We all need a “back to drivers ed” button in our vehicles for just such occassions. We are all Idiots and Assholes on the road. Just wait until convoys of self driving cars get in the way with their Programmed sense of entitlement to the road.